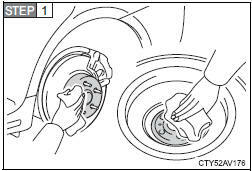 If foreign matter is on the wheel contact surface, the wheel nuts may loosen while the vehicle is in motion, causing the tire to come off. 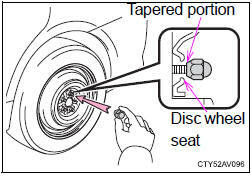 Install the tire and loosely tighten each wheel nut by hand by approximately the same amount. 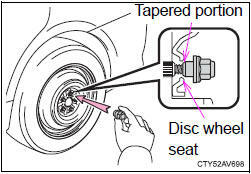 When replacing a steel wheel with a steel wheel, tighten the wheel nuts until the tapered portion comes into loose contact with the disc wheel seat. When replacing an aluminum wheel with a steel wheel, tighten the wheel nuts until the tapered portion comes into loose contact with the disc wheel seat. 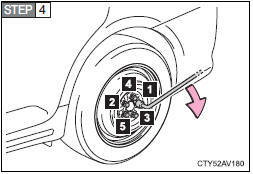 Firmly tighten each wheel nut two or three times in the order shown in the illustration. 5. 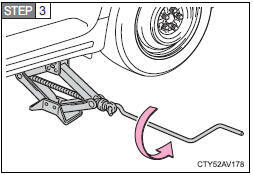 Stow the flat tire, tire jack and all tools.